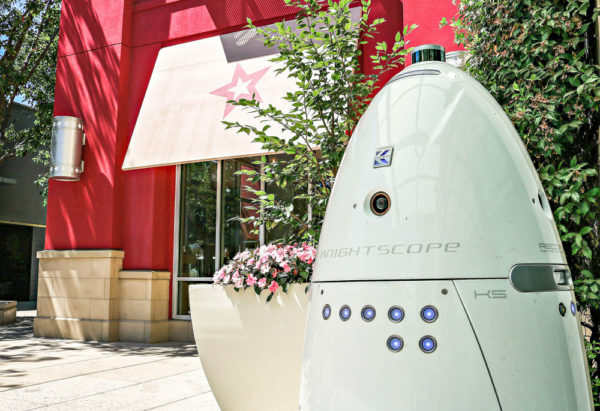 Knightscope, the company that produced the security robot that allegedly knocked down a child and ran over his foot at the Stanford Shopping Center two weeks ago, has released a report of the events that transpired prior to the injury. The robot, which began patrolling the Shopping Center last year, was designed to predict crime by alerting authorities to abnormal events and known criminals. With nearly 30 sensors and laser ranging devices, the robot — called the K5 Autonomous Data Machine — has the capability to sense its surroundings to over 300 feet. Knightscope issued its report in response to a July 8 incident in which one of the K5 machines collided with 16-month-old Harwin Cheng and ran over his foot, according to the boy’s mother, Tiffany Teng. The boy sustained no serious injuries, but did suffer a bruised foot with minor swelling and a scrape on the leg. However, Cheng’s parents spoke out against the machine as dangerous. “He was crying like crazy, and he never cries,” Teng told ABC News. Teng and her husband hoped that by sharing their story they could warn other parents about the robot and convince them to be careful at Stanford Shopping Center. The Shopping Center has suspended all security robot activity until the incident is fully investigated. t initially tried to avoid the child. Teng told the Mercury News that instead of halting, the machine moved forward as her son lay facedown on the ground. In its report, Knightscope agrees that the robot’s sensors did not register an obstacle correctly. Knightscope continues on to say that K5 Autonomous Data Machines have driven over 25,000 miles and operated over 35,000 hours without any reports of incidents like the one Teng described. Knightscope did not respond to The Daily’s request for a comment on the version of events in Business Wire, after stating that they have been in contact with Teng and are “not conducting any further interviews” at her request. The child’s family and Stanford Shopping Center also did not respond to inquiries from The Daily. Contact Michelle Liu at michellemhliu ‘at’ gmail.com.